TomTom pulse monitors convince by an intuitive handling, nice design, and a special size thanks to their innovative technology. The TomTom pulse monitors belong to the first sports watches, which do not measure the heart rate via a separately required chest strap but directly via the GPS sports watch on the wrist. 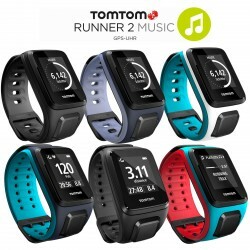 The TomTom Runner 2 Music is a stylish, comfortable to wear GPS fitness watch, which meets the requirements of newcomers as well as experienced running enthusiasts: very easy operation, extra-big display, high functionality, long battery life, etc..
Heart rate measuring of the TomTom GPS sport watch Runner 2 Music is optionally done via a chest strap and not via the wrist. 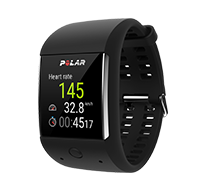 But, the trendy fitness watch provides a 3 GB memory for approx. 500 songs. Listen wirelessly to music while exercising - even without a Smartphone!